Cwm Idwal was the first officially recognised National Nature Reserve in Wales; it was given this status by the Nature Conservancy Council in 1954. Along with Cadair Idris, Cwm Idwal was another favourite haunt of Charles Darwin. He made frequent visits to see the rocks and plants during his studies into evolution. The management of Cwm Idwal is through a partnership of the National Trust, Natural Resources Wales (NRW) and Snowdonia National Park. Cwm Idwal is situated off the A5 between Bethesda and Betwys-y-Coed, approximately 7km south of Bethesda. The turning into the car park is just a 0.5km (300yds) walk to Llyn Ogwen. 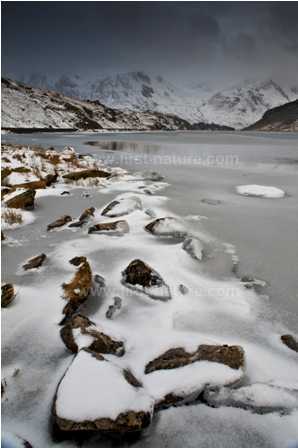 There is open access to Cwm Idwal throughout the year. There are well marked walking paths in the reserve and around the lake, and also rock scrambling routes leading up to the rocky ledges and higher ridges. All of the paths are uneven and unsuited to those with mobility problems. Appropriate footwear should be worn, and as the weather can be highly unpredictable at any time of the year, wet weather clothing should be carried if you are planning a long hike. In high summer it can be very hot in the cwm, and visitors should be sure to carry drinking water with them. There are a Rangers Office, public toilets and a kiosk selling drinks and food adjacent to the pay-and-display car park. At the time of writing there is a project to improve the visitor facilities at the reserve. The cwm or basin forms an amphitheatre behind a glacial lake, Llyn Idwal, and this makes the reserve one of the finest places to see how glaciation and the subsequent retreat of the glaciers affected and shaped this kind of dramatic landscape. Over the years much damage occurred as the result of over-grazing by sheep, but CCW and the National Trust, who own the land, have taken the decision to exclude sheep grazing from the area. This action should give the rare arctic-alpine and ledge vegetation an opportunity to spread to surrounding areas. The small areas of calcareous grassland at Cwm Idwal should also recover and help the plants that grow there and the many insects and other small creatures that depend upon those plants. Cwm Idwal is a botanist's paradise. 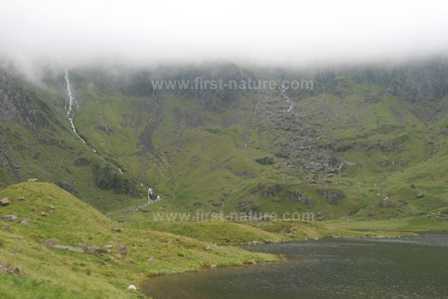 Numerous ferns, mosses, lichens and flowering plants grow throughout the reserve, and in other parts of Snowdonia. The main botanically-rich features to look out for at Cwm Idwal are the cliffs and rocks that support the arctic-alpine plants - the so-called Hanging Garden - and the lake, Llyn Idwal, which also contains special plants. Other wet areas scattered throughout the reserve are home to many other interesting plants and numerous mosses. Rocky ledges in Cwm Idwal and other parts of Snowdonia that are inaccessible to grazing animals are an important habitat for some endangered plant species, in particular the Snowdon Lily (Lloydia serotina), Tufted Saxifrage (Saxifraga cespitosa) and the magnificent Purple Saxifrage (Saxifraga oppositifolia). Tufted Saxifrage has been driven to the brink of extinction in Snowdonia partly due to over-collection of the species. In the 1970s there was a programme to try and reintroduce plants grown from seeds of the original plants, but it has only been partially successful with plant numbers remaining low. Alpine Saxifrage (Saxifraga nivalis) is also scarce and restricted to humid crevices. Both the habitats and the plants that live there are fragile and are protected under the Wildlife and Countryside Act. Conserving the valuable plant habitats of Snowdonia is vital for the survival of many insect species that depend upon them, and a fair variety of butterflies and moths are alive and well there - in particular, Marsh Fritillary (Eurodryas aurinia) and the Netted Carpet-moth (Eustroma reticulata), the latter now being restricted to few areas in the UK. Snowdonia also has its own beetle - the Snowdon Beetle or Rainbow Leaf Beetle (Chrysolina cerealis). This area is one of the few places where the Welsh Poppy (Meconopsis cambrica) can be said to be truly wild. The shaded ledges create sites suitable for plants that would normally appear in woodland - for example Wood-rush (Lazula sylvatica), Water Avens (Geum rivale), Golden Rod (Solidago virgaurea) and Wood Anemone (Anemone nemorosa). Roseroot (Sedum rosea) can also be seen at Cwm Idwal, while around Llyn Idwal Bogbean (Menyanthese trifoliata), Water Lobelia (Lobelia dortmanna) and other plants that are typical of shallow acidic waters grow here in spring and early summer. Other wildlife that can be spotted in and around Cwm Idwal include Brown Hares (Lepus europeaeus), Fallow Deer (Dama dama), Badgers (Meles meles), Foxes (Vulpes vulpes), and the rare and elusive Pine Marten (Martes martes). Polecats (Mustela putorius) are still common in Snowdonia, and if you see Feral Goats (Capra hircus) you are not dreaming - several herds are well established in the area. If birds are your main interest, the craggy mountaintops of Snowdonia are frequented by Merlins (Falco columbarius), Buzzards (Buteo buteo), and Peregrine Falcons (Falco peregrinus). Snowdonia is also one of the last strongholds for the Chough (Pyrrhocorax pyrrhocorax), and this distinctive red-beaked member of the crow family should benefit from active conservation of the grasslands. Below the mountain ridges the magical sound of Skylarks (Alauda arvensis) can be heard, and in the heather moorland both Red Grouse (Lagopus lagopus) and Black Grouse (Tetrao tetrix) take refuge.